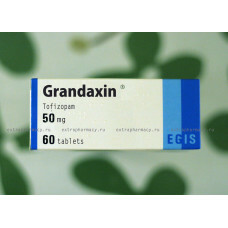 myasthenia gravis, myopathy , neurogenic muscular atrophy and other pathological conditions with secondary neurotic symptoms when anxiolytics contraindicated with severe muscle relaxant effect. galactose intolerance , congenital lactase deficiency or malabsorption of glucose and galactose ( product contains lactose monohydrate) . decompensated chronic respiratory distress , acute respiratory failure in history, angle-closure glaucoma , epilepsy , organic brain lesions ( eg, atherosclerosis ) . Contraindicated in I trimester of pregnancy. At the time of treatment should stop breastfeeding. GI : loss of appetite , constipation, increased separation of gas , nausea , dry mouth . In some cases, possible congestive jaundice . CNS: may experience headache, insomnia, irritability , agitation , confusion, seizures may occur in patients with epilepsy . Allergic reactions: rash, scarlatiniform rash, itching. Musculoskeletal system : muscle tension, muscle pain. Respiratory system : respiratory depression . The dosage set individually according to the patient, the clinical form of the disease and individual sensitivity to the drug. Adults appoint 50-100 mg (1-2 tabs). 1-3 times a day. Of irregular use can take 1-2 tablets. The maximum daily dose - 300 mg. Elderly patients and patients with renal insufficiency: the daily dose is reduced approximately 2-fold.